The brawl started between two students before another student joined the scuffle, shouting that she was defending her cousin. The fight ensued in the presence of a number of students, customers of the supermarket and teachers of ESHS, who intervened to break up the fracas. The brawl follows on the heels of a reported fight that occurred last week inside the old Clarence Thomas Ltd Building in Pasea Estate, where the students have been housed since hurricanes Irma and Maria destroyed the school building in Road Town in September 2017. 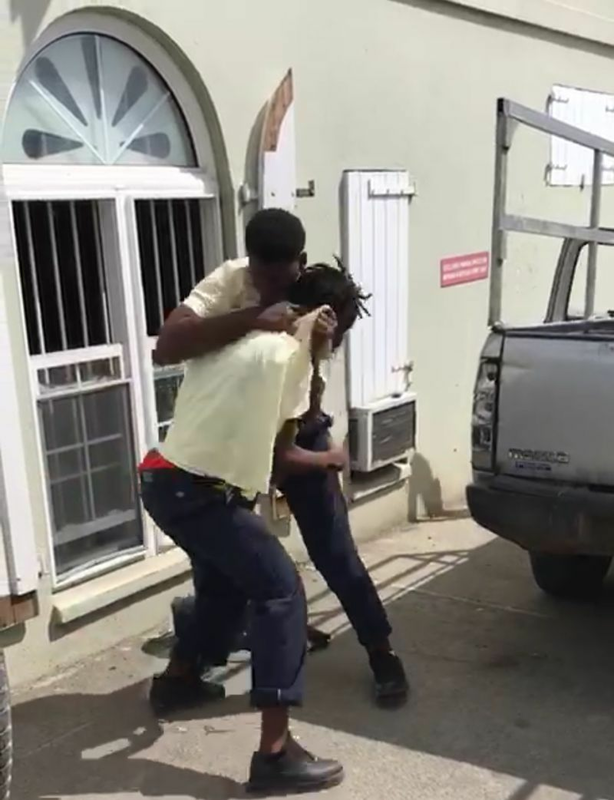 There have been many videos circulating of students of ESHS engaging in disorderly behaviour, including fighting, in the public domain. In December 2017 the Tortola Pier Park placed a ban on children 17 years of age and under from the Government facility unless accompanied by an adult who is at least 21 years of age. This had followed on the heels of Minister for Education and Culture Hon Myron V. Walwyn (AL) stating that students of Elmore Stoutt High School have been "wreaking havoc" in Road Town and that Government was looking to end the shift system as a means of addressing the problem. I cant wait to see how the NDP gets blamed for this!. This is the reason that the crime and everything else is going bad. Parents, teach your children , discipline them when needed. Teach them right from wrong and do not let them out at night unless you know who they are with. You as a parent can do everything correct then all you teach them is lost when they go out and hang out with the bad crowd. to have this happen in public shows the lack of respect for fellow man. Honestly speaking , if you are being harrased at school and you report it to adults and nothing is being done , what else is there to do than to take matters in your own hands.? Y'all always quick to run under here talking crap and don't Even know the History as to why students Fight. the teachers don't care about us. The staff At Elmore stoutt Doesn't Care About Us. Students come to school STRESSED and their class mates BULLY them. And NOBODY sees when that is going on , But when The RETALIATE it makes Headlines On The News.? I don't want hear it. NDP is a FAILURE. POINT BLANK! DON"T PUT THE BLAME ANYWHERE ELSE. WHO SETTING THE EXAMPLE? I agree that at times teachers do nothing when children report BULLYING, because my child who is in primary school is bullied at times and I tell him to ALWAYS report it to the teacher, but when he does, 90% of the times they do nothing. He said this himself. My boy is an A student and I am so tired of the bullying that goes unchecked when reported. At some point and time, one WILL retaliate. @eshs student- I heard you loud and clear. The things when I was in high school and being bullied, reporting to the teachers was just a waste of time. The results of bullies only can come from stress especially having no real way to fully express themselves. The teachers of my time failed me and others and sound like the same DNA is affecting our students. Something needs to be done. My child was always picked on. Children will do him anything they please. When he complaints to the teachers, they say he always complaining. When he retaliate, they will expelled him. For one or two week. A child did to him, the worse thing anyone could do to another human being. That child got 4 days. @news flash I agreed with you 110%. Not sure what type of results they are expecting. Some of these people need to be sterilised so they don't produce another generation of bad seeds. If you cant look after your kids then stop having more. end of story! This is a product of "leh we do dis ting"
I hope that they were arrested and charged for disorderly behavior in a public place. It is high time that their sense of entitlement be snatched away and the reality of consequences for the negative actions toss them like a maelstrom. Also I eagerly await the responses/pathetic excuses to my post. It's not all of them, there are some very well behaved and respectful students attending Elmore Stoutt High School. Fights happen at schools its just a reality. I do think that something has to be done about the loitering outside the supermarket though. I wish all these bloggers would make encouraging comments when the students do positive things. I don't understand why this is news ??? 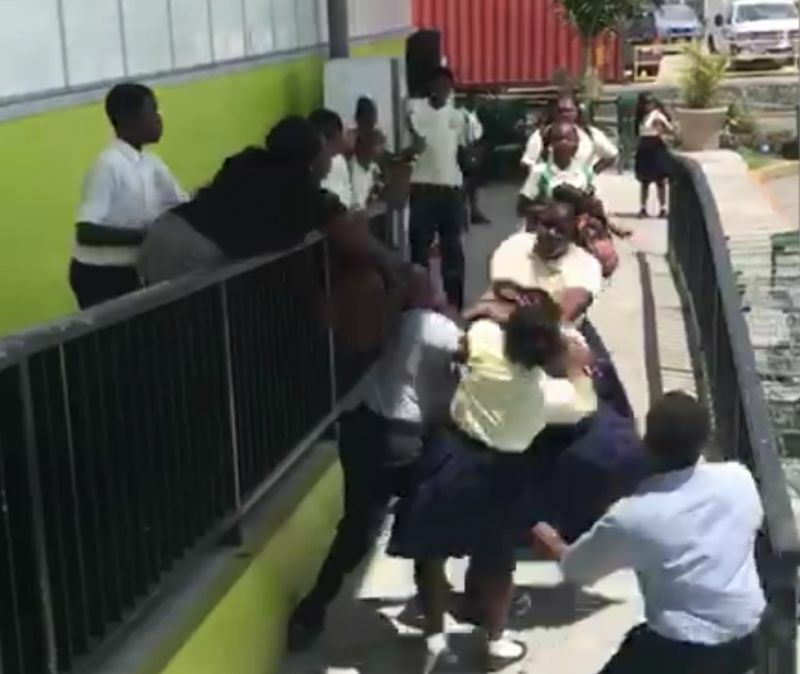 school kid always fight in the bvi and in every other country in the world . I think this is a tragedy. These kids have gone through 2 hurricanes and a flood. Their parents I am sure have lost a lot. A lot of them are in single parent homes with many mouths to feed. They have lost their schools. They are stressed also. How about counseling instead of arrest? How about an interest in their lives instead of arrest! I feel bad for these wayward kids. They are crying out for help! They lost a lot but have no control over any of it. They need positive role models. Up to us adults to try to help and try a ting! My sentiments exactly. The negative blogs are not helping either. we must seek for the good rather than highlight the negatives. God only knows why they had the brawl, needless to say everyone including the kids are still stressed from the turmoil so let us encourage rather than discourage. I hope the children are well and not hurt. How can it be a lie.? No one Knows or See when things begin. We made numerous complaints , NOTHING was done. ESHS waits till things get out if hand TO MAKE DECISIONS . Majority of the time They Could prevent Situations. We are Emotionally and Physically DRAINED. Parents go through things too and can't always be behind their kids. At the end of the day We should all be disappointed in ourselves. Parents for not taking action , kids for being defiant , Teachers & Staff for Not Aiming to prevent , People who only want to have negative things to say instead of helping. We must understand that while this is a grave issue that must be addressed relative to parent/teacher/child, we should first seek to remember that all this negative press is seen worldwide and with the state not returning as fast as we would like to better normalcy this is not helping. As opposed to writing the negative, address and acknowledge the situation that it occurred yes but still come back with something positive like it will be addressed so that the children can focus on more important things like education. We need to stop with all this negative press as it is turning away many visitors and even locals and instilling a sense of fear which is quite unhealthy. God continue to pray for our country. Prayer,intercession,counselling,good parenting,intervention programs etc are needed. That's understood without saying. You know what though, all the excuse making and ostrich syndrome thinking must cease immediately. There are good and bad children. They all need help. We all need help. We all have stresses. A lot of us went to school too. Your society is failing because of your sense of entitlement and excuse mongering. Everything to do with maintaining the highest morals seems to be a problem. Your children and adults ride scooters without helmets but that's small thing.Murder,sell drugs and engage in all sorts of nefarious activities but I don't see you all reporting them to the police. The police don't respond to a situation though,Oh gosh the blogs would be full of opinions and advice. I dare you all to give info on the Penn guy and Trinity murder. Some families and friends are covering for those involved. NDP nor VIP are not problems or solutions. It's some of you parents that spoil your children and they in turn are rotten and blacken-lunged. Plagues to the society. So I realise now that you all know what's right in the BVI but some pretend otherwise. Now is the time to take life by the horns and take this place to Righteousness or else it would come back to haunt you in the not so distant future. Have mercy. And if you happen to be shopping while they are there, very annoying, almost rude, blocking isles hard to navigate pushing a cart. And they look at you like you don’t belong there, but I’m the one spending the $100+$$$$$. It's too outta hand. RVIPF knows that children hang around there. The police commissioner office is upstairs Riteway which has a clear view of the carpark. It's a disgrace because I ask what rhetoric he'll come with to explain the lack of response from the RVIPF. Killing close to Road Town station recently, gunmen storming the station,people breaking into the station to steal bikes and now a fracas by The Commissioners office. You see the respect for Law and Order is at an all-time low. Let's take back our country from these terrorists my people. If you don't stand up for Righteousness then you accept the evil and corruption. The press is giving them free coverage. They believe they are important. It's high time these bullies and their parents are taught a hard lesson. Hit them where the pockets hurt. Sue for emotional and mental distress, pain and sufferation. And if they are so brave to touch what they didn't push out at Peebles then throw in physical harm with an official police complaint. I bet they going slow down after that. I dont want any bullies to cross my children path. These parents better warn their children.